Our Liverpool veterinary team knows how much your pet means to you – especially since they are all pet owners. Their knowledge and experience ensures that at every stage of your pet’s treatment, they are always in good hands. If you wish to see a specific member of the veterinary team, please use the calendar icon to check their availability. 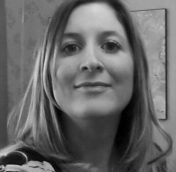 Helen’s career in Customer Service and Relationship Management has enabled her to live in various places including Gibraltar, Windsor and the Caribbean. Her love of animals led her to be heavily involved in an animal rescue foundation in the Caribbean. The foundation focused on the welfare of dogs and cats and worked hard to home rescued animals. 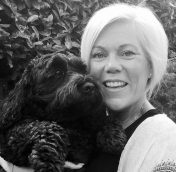 Having returned to the UK, accompanied by a much loved Caribbean Island dog, Helen has worked in her home town of Liverpool, furthering her career in Customer Relations. Helen loves being with her family pursuing all things outdoors. She often “borrows” her sister’s crazy Cockapoo Bonny for park walks, since losing her own dog last year. Any other spare time is spent with friends and travelling. Aurore qualified as a Veterinary surgeon from the Veterinary School of Toulouse (South of France) in 2007. She then pursued 1 year of rotating internship and 2 years of surgical internship there. After working for 4 years in an emergency and referral practices near Paris, she decided to move to the UK for a new challenge in 2014. Her main interests in the veterinary field are emergency care and surgery. Outside of work, Aurore likes socializing (especially around a table full of cheese and wine!!) reading and most of all travelling. She belongs to a cat called Morphine who is the actual boss of the household! Joanne commenced her career with the Civil Service in 1990. Throughout her working life she has gained extensive customer service knowledge and spent several years in management, following recent voluntary redundancy Joanne felt it was time for a career change. 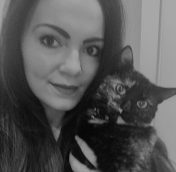 She is delighted to continue her career at the Vet, providing customer care with the bonus of pet cuddles. Animals have always played a big role in her life. Joanne’s family have always owned dogs and she has a passion for horses. 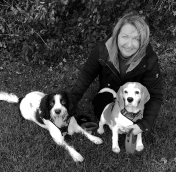 Joanne currently has 2 dogs Parker the Springer Spaniel and Jasmine the Beagle. She also owns a horse named Isla. Joanne spare time is mostly spent at the stables caring for Isla and walking Jasmine and Parker. Alice is originally from the Midlands and studied at the University of Nottingham. She moved to Cheshire after graduating in 2013. She started in a mixed practice and has recently finished her 1 year small animal internship. This has reinforced her interests in surgery and diagnostic imaging. At home Alice lives with her boyfriend (who is also a vet!) and their 3-year-old Staffie, Indy. Outside of work she enjoys crafts, sewing, running and going to see live music. She also has a particular love of wild hedgehogs and their rehabilitation. Laura qualified as a vet from the University of Liverpool in 2015 and has worked as a small animal vet in Liverpool since then. Laura joined the team at The Vet in May 2018. Laura has two beautiful Ragdoll cats called Fennel and Aubergine. Outside of work, Laura enjoys playing in a ukulele band and growing her own vegetables. 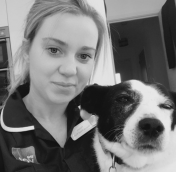 Helen qualified as a vet nurse in 2006, She has been a Head Nurse previously and just spent the last two years at a referral practice as an internal medicine nurse. 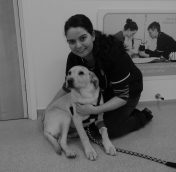 Helen moved to Liverpool recently so joined The Vet Liverpool as Deputy Head Nurse. Helen has two dogs, two cats and two horses. She competes at dressage and occasionally does Flyball with one of herdogs. Helen also likes travelling and just started learning to ski! Sarah has been an animal lover since childhood, and becoming a Veterinary Nurse was always her dream job. She started her nursing career in 1994, qualifying in 1996. Since then she has worked in a busy, small animal Veterinary Hospital over the last 21 years. Sarah enjoys all aspects of nursing with a particular interest in surgical/theatre nursing, and dealing with pet insurance claims. At home she’s a mother of one and in her spare time enjoys going to concerts, walking and spending time with family and friends. Sarah also enjoys being crafty and hand-makes her own greetings cards. Sarah currently doesn’t have any pets but – if her fiancé ever allowed her! – would love to keep chickens. Nicola has been practicing veterinary medicine for 16 years, qualifying 10 years ago. She is a trained clinical coach, which means she is qualified to mentor veterinary nurse students during their training. Nicola particularly enjoys interaction with customers, nurse consultations and laboratory work. In Nicola’s spare time, she enjoys watching films and having family days out with her children. Hannah qualified as a veterinary nurse in July 2016 from Myerscough college. 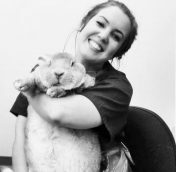 She enjoys all aspects of nursing but particularly enjoya looking after bunnies and ensuring that they get the best care possible. She has two rescue bunnies of her own at home called Albert and Mabel. At home she also has two dogs, Lilly a Staffie X and Arlo a Yorkie X, who keep her busy and are always up to mischief! Rachel began working in the veterinary industry in 2001 when she was 15 years old. 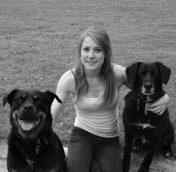 she qualified as a veterinary nurse in 2004 and quickly went on to gain a qualification as a veterinary nurse assessor. This meant that she was able to teach and help the students that worked alongside her on a daily basis. 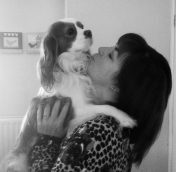 In 2010 Rachel became Head Nurse of a large veterinary practice in Liverpool and helped to provide a high level of care to our clients and patients on a daily basis. She enjoys all aspects of veterinary nursing but has a particular interest in theatre/surgical cases. As well as a passion for anything involving cats! At home she has two rescue cats; Rufio and Hero who were abandoned in a park but are now living the high life (as cat’s should do!). After having some time off to have her son, Rachel is now ready to get back in to the swing of practice life at The Vet! Originally from Harrogate, Sophie moved to Liverpool in 2008 to complete her zoology degree, fell in love with the city and stayed. Sophie lives with her lovely husband and gorgeous daughter. She is currently trying to persuade her hubby for a fur baby too! Sophie has always had a love for animals and a passion for animal welfare. This passion allowed her to work in a variety of animal-based professions, which led to working within the veterinary industry for the last 5 years. 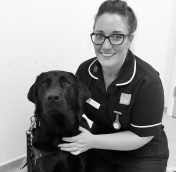 Sophie qualified as an RVN in early 2017 and has loved every minute. She has a particular interest in surgical nursing, radiography and nurse clinics. Sophie’s spare time is spent with her Liverpudlian and Yorkshire family, enjoying good food with friends and going to see live music. Corrin has always had a passion for animals since she was a child. 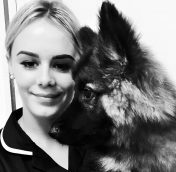 She originally chose to study Business and then came across a job opportunity in a veterinary hospital which made her realise she wanted to work with animals as a career. Corrin has a West Highland Terrier named Hollie who she rescued from an animal shelter and she has an African grey parrot named Joey. She enjoys spending time with family and friends, keeping fit and healthy, and spending time with animals. Corrin aspires to become a Veterinary Nurse in the future. Isla moved to the North West from South London in 2013 to complete a degree in Animal Behaviour and Welfare. 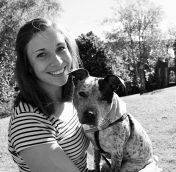 She is currently undertaking a Masters degree in Clinical Animal Behaviour and has worked with animals in a variety of veterinary related environments for 11 years. Isla has a love of large dog breeds and owns two rescue dogs; a Rottweiler called Teddy and a German Shepherd cross called Basil. Her spare time is mostly dedicated to her friends and the animals in her life. Kate has been an animal lover all my life, she grew up in Liverpool with her mum, dad and older sister called Charlotte. After begging her parents for years for a dog they finally caved when she was 9 years old. 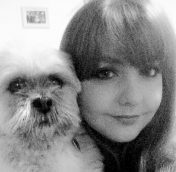 Kate got a Lhasa Apso called Meg who is now 11 years old. She originally studied digital SFX animation at edge hill university where she got a certificate of higher education, but after doing volunteer work at dogs trust she realised that she wanted to work more with animals than with computers. 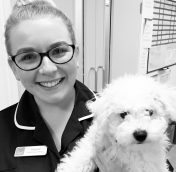 When the job came up to work at the vet she jumped at the chance to work in a veterinary environment as it’s her dream job to become a veterinary nurse. In her spare time, she loves to go out with her friends and family! Kate’s favourite hobby is to paint and to draw on her computer tablet! Chelsea has always wanted to work with animals. She has previously volunteered for Carla Lane animals in need. Chelsea’s key strengths have always been with the public as most of her work experience has been customer service. This job role suits Chelsea perfectly as she loves both working with the public and animals. In her spare time Chelsea loves spending time with her friends and family. Chelsea has a strong passion for singing and recently studied a musical theatre course. She has a gorgeous cat called Chance and a rabbit called Millie. Collette grew up in what she describes as ‘a bit of a zoo’ with a family that loves animals; her first pets were a pair of Fantail pigeons that her dad brought home when she was about eight years old (although she thinks they were really for him!) There was also a duck, a goat, several cats and dogs with litters of kittens and puppies and an aviary in the back garden. She has a five year Cavalier King Charles Spaniel called Oscar. 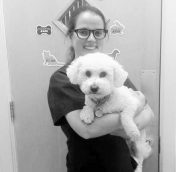 Collette has lots of experience working with the public in a customer service role and enjoys working at The Vet as it also gives her the opportunity to meet lots of cute puppies. In her spare time she enjoys spending time with her family and doing needlework including cross stitch and crochet. Hannah moved from Hereford to Liverpool in 2000. She has been grooming for nearly six years and has never looked back. She’s attended various seminars run by some of the biggest names in the business, and has competed in grooming competitions several times. In her spare time, Hannah enjoys showing Boxer dogs and has been doing so since early 2008! Alongside the showing, she is a committee member of the Merseyside Boxer Club. 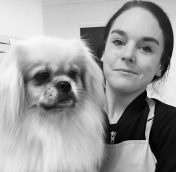 She can groom to breed standard or to an owner’s personal requests, plus her seminars have taught her about international grooming trends!